Islamabad needs to start working on proper plans to handle the human impact of climate change. There is a direct and deep linkage between climate change and migration. The International Panel on Climate Change (IPCC) assessed that the magnitude of human displacement may increase due to climate change in the 21st century. There is a difference between climate refugees and climate migrants. Those who leave their place of residency because of sudden environmental change are referred to as environmental refugees, while those who leave due to gradual, long-term climate change are called climate-induced migrants. Generally, there are three types of migration patterns induced by changes in the environment and climate: 1) temporary migration due to cloud bursts, torrential rains, flash floods and so on. Such migrants temporarily leave their homes with the hope to return after the calamity is over; 2) permanent migration due to sea intrusion, in which the seawater encroaches the coastline and forces people to move permanently further inland; and 3) migration caused by Glacial Lake Outburst Floods (GLOFs), in which people live a nomadic life under climate insecurities. Pakistani climate-induced migration is mainly caused by floods and heat stress, which force people to migrate temporarily or permanently. For example, people in Gilgit-Baltistan over the past few years have faced unpredictable extreme weather conditions, resulting in torrential rains, flash floods and landslides. These conditions forced people to migrate. Monsoon and snowfall patterns have also shifted due to a rise in temperature in Pakistan in the past few decades. The summer monsoon has shifted toward the end of the season and the winter rains have shifted toward late February and March. Likewise, the snowfall season in Pakistan that usually started in November and ended by December now extends through March. Climate change has displaced large population in different regions across the country. For example, seasonal changes have urged people to move to other places to avoid climate-induced hazards and to seek shelter and livelihood. The Karachi heat waves in 2015 killed many and forced others in Sindh to move during summer. Below-average rainfall in the Tharparkar desert and southeastern Sindh during the monsoon in 2016 resulted in drought and lower crop production, hence forcing hunger-stricken people to migrate to other areas for food. Similarly, the people living in Pakistan’s northern areas during extreme winter and heavy snowfall temporarily migrate towards the plains and return when the weather becomes normal. 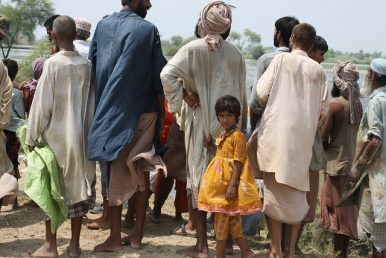 The population near the Indus delta have witnessed large scale migration due to sea-intrusion, coastal floods and rainfalls. Climate change is also affecting agriculture and business sectors in Pakistan’s semi-arid regions, resulting in migration of farmers and others from rural to urban areas. Unfortunately, very little literature is available on climate-induced migration and environmental refugees in Pakistan. Climate change is an inevitable threat and can trigger large-scale climate-induced migration in environmentally fragile areas in Pakistan. The government would be wise to formulate relevant policies and strategies to deal with climate-induced migrants and environmental refugees. The humanitarian capacity to deal with the displacement of people must be improved. The socio-economic and health problems faced by climate refugees and climate-induced migrants in Pakistan must also be addressed. Aymen Ijaz is a researcher at a think tank in Islamabad. The depletion of natural habitats in Pakistan is a problem in need of greater attention.